This sample was prepared by using a Multi-tool workflow. The preparation yielded a high-quality cross section ready for SEM imaging. The solder bumps were prepared for the SEM in a two-step process. In Step 1, the LatticeAx™ cleaver was used to cleanly cross-section close to and parallel to a specific row of copper bumps. 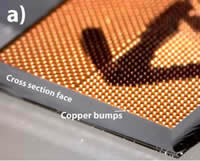 The copper bumps had a diameter of 85-µm and were cleaved 30-µm from the center of a bump. The time to cleave was 5 minutes. 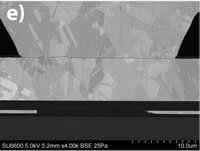 In Step 2, a broad, argon, ion-beam instrument, the Hitachi IM4000, was used to prepare the final imaging surface. The sample was mounted topside down on a sample block to perform backside milling. 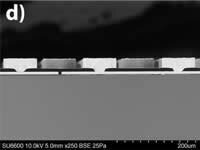 Backside milling was used to prevent artifacts of ion beam milling that can occur as a result of sample topography. 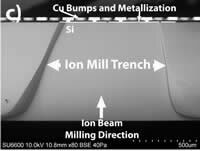 By cleaving close to the center of the copper bumps, the time on the ion mill was minimized. No further preparation was performed.